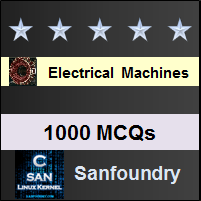 This set of Electrical Machines Multiple Choice Questions & Answers (MCQs) focuses on “Synchronous Machine Applications”. Explanation: Synchronous machines are the main generating section of the power plants. 2. ______ alternator is used in thermal stations and ______ alternator is used in hydel plants. Explanation: Due to salient poles, the machine will not run at very large speed and it becomes less rugged. Explanation: Synchronous compensator is a source for the reactive power. Explanation: All the listed factors are disadvantages for using a synchronous motor. Explanation: All the performance torques are needed to know before using any synchronous motor. Explanation: As the field is on rotor itself, the sir gap will be stationary w.r.t. rotor. Explanation: Thermal plants use cylindrical rotor synchronous machines. Explanation: Thermal and nuclear power plants have high speed requirements and hydel power plants have salient pole generators so the speed is also less. 10. Synchronous motor has been preferred for driving the loads requiring high power at low speeds. Explanation: Synchronous motor acts a capacitor when operated at leading p.f. with no load. Explanation: To obtain mmf and emf drops the loading is done as a synchronous motor. 12. Below are the statements about cylindrical rotor alternator. Explanation: Both the statements are right. Explanation: Air gap voltage will lead the field flux by 90° in a cylindrical-rotor alternator. Explanation: During short circuit condition, the magnetizing current flows to provide the core losses compensation. So the pf is slightly zpf lagging. Explanation: Check the phasor diagram.